Squeeze lemon juice over the skin and inside the cavity of each fish, season all over with salt and ground black pepper, then put a thyme sprig in each cavity. Stretch each bacon rasher using the back of a knife, then wrap two rashers around each fish. 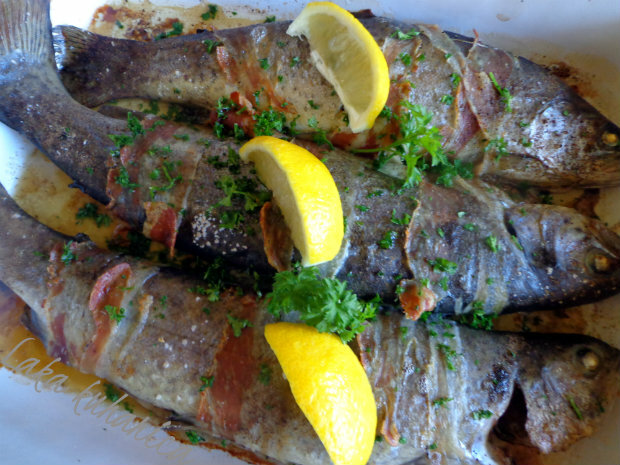 Place the fish in a shallow ovenproof dish, lightly greased with butter, with the loose ends of bacon tucked underneath to prevent them from unwinding. Bake the trout for 15-20 minutes in an oven at 200°C, until the flesh flakes easily tested with the point of a sharp knife and the bacon is crisp an beginning to brown. Transfer the fish to warmed individual plates and serve immediately garnished with chopped parsley and sprigs of thyme and accompanied by lemon wedges. The blanket of bacon keeps the fish moist and adds flavour at the same time.